Med Europe patented device. Spritztube is a tracheal tube for advanced and complete airway management, made of reinforced medical grade silicone and resterilizable up to 30 times. It features two dedicated balloons, kept in line by a malleable spindle: the esophageal one inflated with 10 cc of air and the supraglottic one inflated with 60 cc of air. 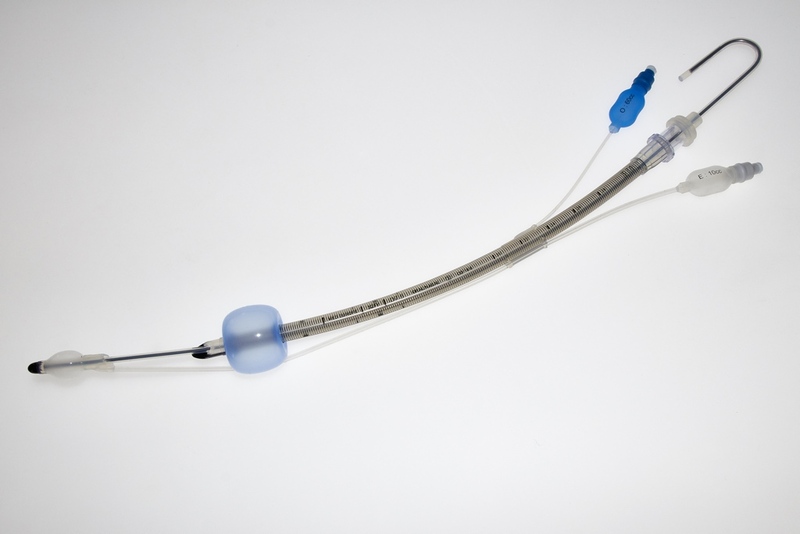 With both cuffs inflated, Spritztube® works as an extraglottic airway device and ensures the patient’s ventilation, giving the anaesthesiologist time to evaluate the next steps. If the intubation is required, the proximal cuff is deflated, and Spritztube® is advanced through the glottis with the laryngoscope guidance or thanks to the use of fiberscope, which can be inserted directly through the Spritztube®, without stopping the ventilation. Any existing intubation technique is possible, depending on the operator’s preference and skill level. This implicates that the intubation maneuvers are simplified, since they don’t require additional external endotracheal tube or tube exchange procedures. In fact Spritztube® is the only existing device capable of turning from extraglottic to intraglottic because it itself acts as an endotracheal tube. For further information, please visit the dedicated website. April 2018: first study published (go to the article). Copyright © 2019 – SIM Italia S.r.l. All rights reserved. Site reserved exclusively for professional sales personnel.